Shrooms are amazing and chaga (shh-a-ga) is my fav. This big guy grows inside birch trees, the portion that forms outside the tree looks like charred wood, and the inside is dense red/orange. When harvested and dried it’s hard as rock, you’ll have to smash it with a hammer to break off a piece. 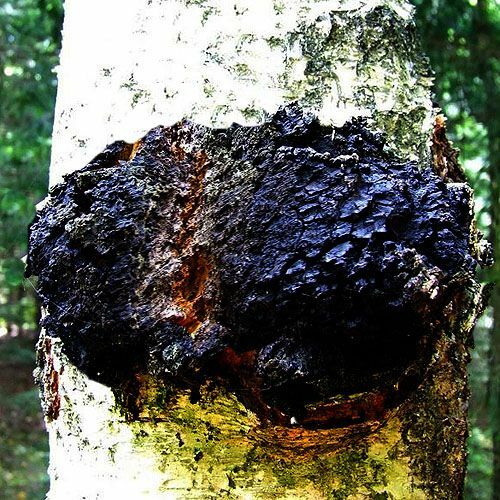 Chaga has countless healing properties, which can be extracted using water, alcohol and fat methods. Here is a simple recipe for delicious chaga tea (water extraction), or add chaga powder and tinctures to your smoothies or any healthy recipe to up the nutritional content. Place chaga and cinnamon stick into jar, pour boiling water and leave to sit on the counter or in the sun for 8 hours, or overnight. Reuse the same piece several times. I feel great when I drink this tea, I love the taste as it’s not bitter and I’m fascinated by its ancient history. David Wolfe has a great book all about Chaga. I could go on but we like to keep it brief at THE GOODS. And if you’re not into mushroom hunting you can buy chaga at Qi Naturals, Kind Herbs at Sorauren Farmer’s Market, and The Big Carrot.